So after some 40 years since your last visit to the Verdon Gorge, and wanting to return for so long, how was the experience and did it match your expectations? It was fantastic. My memories of the Verdon Gorge were from a rock climbing trip there in my late 20's with a bunch of wild friends from Bristol. We were climbing on the main cliffs and I can remember sitting on the belays paying the rope out and looking down into the gorge below. I remember thinking, "wow, that looks great down there. I must come back one day and walk along the bottom of the gorge". We had all sorts of adventures, but I never forgot that moment when the ambition to trek down the gorge was born. Yes, it did match my expectations!! It is a brilliant walk. Every day there is phenomenal scenery and in the evening you stay in great little hotels in typical French villages. From your photos, the water of the Verdon River looks turquoise and very inviting, did you get any opportunities to take a refreshing swim? Yes, on Day 2 when you descend from the Belvedere de Rancoumas you cross the river and there is a swimming place there. It was a very hot day and the swim was extremely welcome. There's another opportunity on the next day at the picnic lunch stop on the Martel Trail, and some of us did that too. Was there lots of flora and fauna to be seen on the trails? Yes, lots of interesting flowers, including wild orchids, but we didn't see a great deal in the way of fauna. There is evidence on all the paths of wild boar and there must be lots of them around but we didn't see any. However, we did see very many Griffon vultures. These were re-introduced a few years back in Verdon and are doing well . They are huge birds, with a wingspan up to 3 metres wide. Although we didn't see any quite that big, they were nonetheless very impressive. What are the paths like during the walks through and over the gorge? Well formed, and well marked. All paths are rocky, most are easy and straightforward, but in some places the terrain is a bit rough. Did you find any part of the walks particularly difficult? Nothing was particularly difficult, but I found some of the days pretty long. As a result, we have improved the itinerary by reversing the direction in which we undertake the Martel Trail. It is much better to do this starting at La Maline and finishing at Point Sublime. Also we have changed Day 1 to avoid walking on the main road. Lastly, on Day 7 we now finish at Chasteuil instead of walking all the way to Castellane, which makes for a much better day. Really, I am so taken with this trek that I would love to do it again. It was so enjoyable. As the holiday has been graded ‘Vigorous’, what would you say would be suitable preparation prior to going? Certainly it was a harder trek than I was expecting. Distances ranged between 10kms per day to 16kms, and hours walking anything for 6 to 9 hours. Training? - lots of long weekend walks and hill walking generally. Believe me, if you're a strong walker, you'll love it! 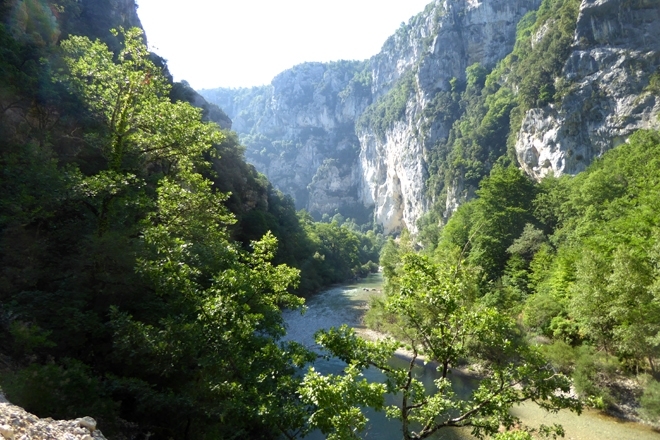 For a full itinerary, departure dates and prices see our Verdon Gorge Trek information, or watch a video of Steve's trek.